Hey friends! Hope you're having a great week!! If you want to refresh your memory of my mudroom, you can look here and here. 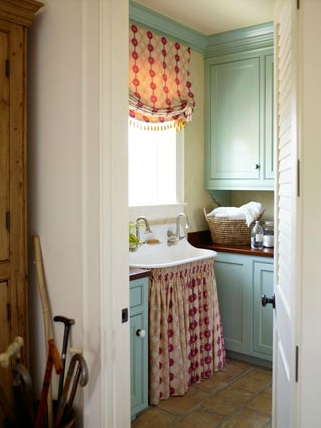 I recently posted this picture of a laundry room in designer Wendi Young's home. I commented on how I liked the color of the cabinets. Well, I got a wild hair this weekend and decided I needed to paint my mudroom cabinets. This is an old picture. Apparently when I get a wild hair, I forget to take "before" pictures. Anyway, imagine these cabinets against a chocolate brown wall, and you get the idea. I decided to paint the cabs with Sherwin Williams' Halcyon Green. It's a pretty blue/green color, and I already had a can left over from a previous project. Score! This has been a rather time-consuming project, so I have only completed the bottom cabinet. In fact, I haven't even re-attached the doors. I want to make certain they are completely dry before I start messing with the hinges. But, here's a sneak peak of what it's looking like so far. Now, here's where that wild hair of mine got really out of control. You may have noticed the hideous laminate countertop. Well, I may eventually replace it with a slab of granite my parents gave me. However, I'm still indecisive about it, and I've got other items higher on my "to do" list, so I was contemplating a temporary fix. Since taking these pictures, I have added a second coat of paint, and it's looking sooooo good! I have no idea if this is an appropriate use for chalk paint, but what the heck! I'll seal it real well and see how it holds up. Right now, it's far better than the ugly laminate. I'll be back tomorrow with pictures of the completed cabinet (doors and all). Then I'll tackle the upper cabinets. And, then I'll organize my cabinets so you won't be appalled by my disorganization. I was so excited to show you the cabinet and countertop that I didn't have time to be embarrassed by the mess! What do you think? Have I gone too far with the chalk paint? What would Annie Sloan say? I will be interested in how your counters do..but I can tell you the chalk paint has held up very well so far on some laminate cabinets so I think you are on to something! That looks awesome! Can't wait to see the finished room!! Oh, I am so hoping the paint holds up on the counter because I have ugly teal laminate counters in my closet and I am so ready to paint them. The blue looks lovely on the cabinet - can't wait to see the completed laundry room! You are so brave! The counter tops look awesome with your cabinet and wall colors. I can't wait to hear how they hold up. How fun! I love that you just went with your instinct. It looks great and I bet it holds up well after sealing. I have a little bit of Old White left from several projects and this gives me new ideas. I think that paint will work anywhere! Thanks for sharing at Southern Savvy Style! Heck, so now youwill wax it I guess...I need to know how this turns out before I get the wild hair and just go for it on one of my many ugly formica countertops!! And the cabs are going to be incredible! The cabinets look great and way to be brave on the countertops--they look amazing! Thanks for linking up to Share the Love Wednesday! This looks so good. Hope the counters hold up well, but even if they don't you were going to replace them anyway, so no harm, right? I wish I was that impulsive sometimes! I love how it turned out. I think the chalk paint will be fine. I spoke to someone who sells it and she said I could have used it on my floors??!!! How long did the chalk paint stay on the counters? How well did it hold up?